We are pleased to announce that the Abdus Salam International Centre for Theoretical Physics (ICTP), and its Office of External Activities (OAE) has approved continuation of the NT-03 “Cosmology – Classical and Quantum Challenges” program to support research and training program of the SEENET-MTP Network. The grant will be used for the exchange visits of the Network members in 2019. The OEA provides support to cover the travel expenses of scientists who belong to the Network to visit other member Institutions and contributes towards their living expenses. The project NT-03 is the continuation of the ICTP – SEENET-MTP project PRJ-09 “Cosmology and Strings” (2009-2016). For information about the new Terms & Conditions, please, see here. For proposals towards using individual grants contact the representatives of your Institutions in the Network Committees and the SEENET-MTP office ( ) at your earliest convenience. The special issue titled “Field Theory and the Early Universe” devoted to the SEENET-MTP Balkan School and Workshop BSW2018 was published as the special issue of the International Journal of Modern Physics A (Volume 33, Issue 34), guest editors are Ignatios Antoniadis and Goran S. Djordjević. The issue is available here. International School for Advanced Studies (SISSA) in Trieste (Italy) announces 5 PhD scholarships in Statistical Physics. The PhD will start in October 2019. Applications can be presented from 15 February onwards and candidates will be selected shortly after the deadline of 15 March. In case of vacancies, 31 August is the deadline for a second independent selection. More information can be found of the web-page of the group. The Advancing Theoretical Astrophysics Summer School is a two week long, international summer school intended to build and strengthen essential skills in physics and computation for a career in theoretical astrophysics. The school will be held at the University of Amsterdam (Netherlands) from 15 to 26 July 2019.
degree in astrophysics, with a BSc degree in physics or astrophysics. The school will be a mix of short topical lectures and interactive problem solving, using methods that can be applied to a wide range of topics. Students will work collaboratively on several types of canonical problems (with guidance from teachers and more advanced students), gaining hands-on experience with cutting-edge techniques employed in modern theoretical astrophysics. Deadline for the application is 15 January 2019. More information about the school is available here. Best wishes for a joyous holiday season with peace and cheer in the New Year 2019! 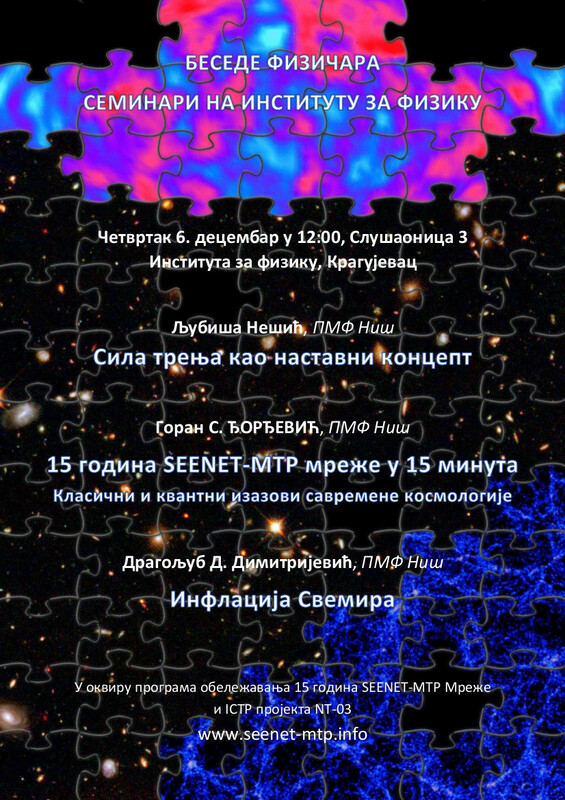 In the framework of the Program of celebration 15 Years of the SEENET-MTP Network and SEENET-MTP – ICTP Program NT-03 “Cosmology – Classical and Quantum Challenges” Prof. Dr. Goran Djordjević, Prof. Dr. Ljubiša Nešić and Dr. Dragoljub Dimitrijević (The SEENET-MTP Office; Faculty of Science and Mathematics, University of Niš) visited the SEENET-MTP Network node Faculty of Science and Mathematics, University of Kragujevac on 6 December. on 4 December 2018 at 17:00 (room No. 306). This research-exchange program is organized in the framework of the SEENET-MTP – ICTP Program NT-03 “Cosmology – Classical and Quantum Challenges”, and partially supported by the SEENET-MTP Centre, Centre for Theoretical physics and Chair for Theoretical Physics and application – PMF Nis. on 29 November 2018 at 11:00 (room No. 306). Prof. Dr. Goran Djordjević, Prof. Dr. Ljubiša Nešić and Dr. Dragoljub Dimitrijević (The SEENET-MTP Office; Faculty of Science and Mathematics, University of Niš) will be visiting the SEENET-MTP Network node Faculty of Science and Mathematics, University of Kragujevac on 6 December. This visit was organized in the framework of the SEENET-MTP – ICTP Program NT-03 “Cosmology – Classical and Quantum Challenges” and Program of celebration 15 Years of the SEENET-MTP Network. Prof. Dr. Miroljub Dugic from the Faculty of Science and Mathematics, University of Kragujevac (Serbia) is visiting Niš on 12 – 15 November 2018.
on Wednesday, 15 November 2018 at 14:00 h. The talk will be held at the Faculty of Science and Mathematics, room 100. This visit was organized in the framework of the SEENET-MTP – ICTP Program NT-03 “Cosmology – Classical and Quantum Challenges” and CANTATA COST action CA15117. Prof. Dr. Goran Djordjevic (Executive Director of the SEENET-MTP; Faculty of Science and Mathematics, University of Niš, Serbia) visited Institute of Theoretical Physics – Faculty of Physics University of Warsaw (Poland). on 18 October 2018, at the The Faculty of Physics, University of Warsaw, as a part of the Seminarium “Teoria cząstek elementarnych i kosmologia“. This visit is organized as a part of the SEENET-MTP – ICTP Program NT-03 “Cosmology – Classical and Quantum Challenges” and cooperation of the SEENET-MTP Centre Niš and Institute of Theoretical Physics Warsaw.